Our Tuk Tuks are the perfect vehicle to have an overview of the city in a short time, at the end of our guided tours, whether you choose a tour of a specific area or full city discovery, you will be able to situate yourself and choose what places you will like to spend more time on. Our tours are made to introduce you this great city so you “fall in love with Madrid”. Discover Madrid + La Latina + Malasaña: the most complete tour, a whole experience of Madrid in only 120 min! Discover Madrid: the best seller. 75 min of tour to explore the history and the evolution of the city! Romantic: Yes….but no cloying, Let your love flow with a bottle of Lambrusco during the tour. Sunset in the capital: Enjoy the most beautiful moment of the day in the park popular for the occasion! Highlights: our quick tour to visit the most popular places of Madrid! La Latina: the evolution of the city. The best combination of culture, tradition, tapas and mojitos! Malasaña: the Hipster. 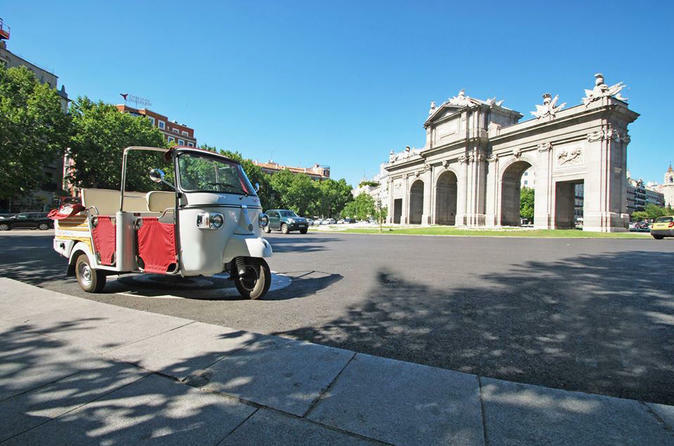 Visit the more unconventional part of Madrid and discover the alternative history of the city. Personalized: as you wish! Just let us know when and where and we will be there!